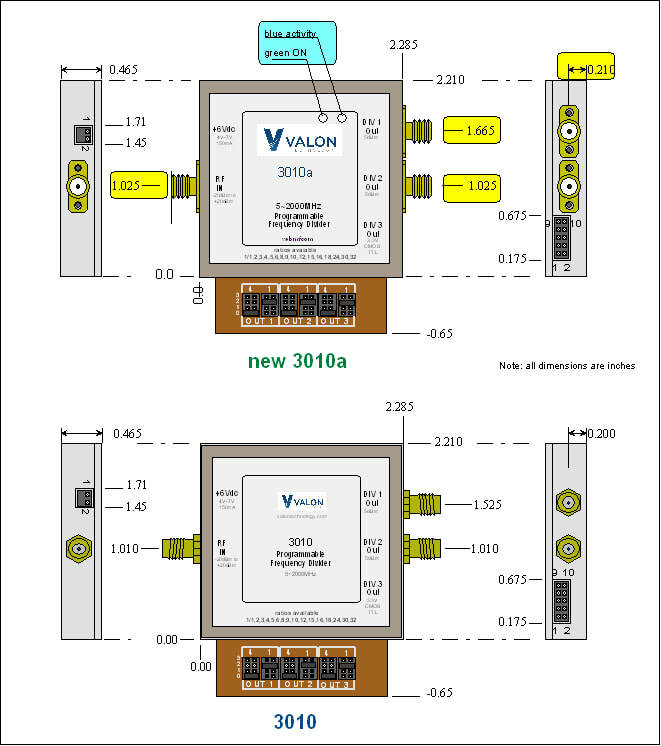 Our policy at Valon Technology is to keep our products as consistent as we possibly can so that our customers can rely on continuation of form, fit and function between all units of a specific model type. When it does become necessary to make a change, we will provide advance notice and an appropriate change to the unit model number designation. The locations of the SMA RF connectors used on the 3010 Programmable Frequency Divider will be changing slightly after the exhaustion of the existing stock. This change is being made in order to accommodate a change to the SMA connector types used in order to ensure adequate supply to meet user demand. This change has no effect on electrical performance. The new model number will be 3010a and will be listed as such on the label. Also, the new label will more clearly display the green LED on indicator and the blue LED activity indicator. The mechanical changes are shown highlighted in the drawing below.